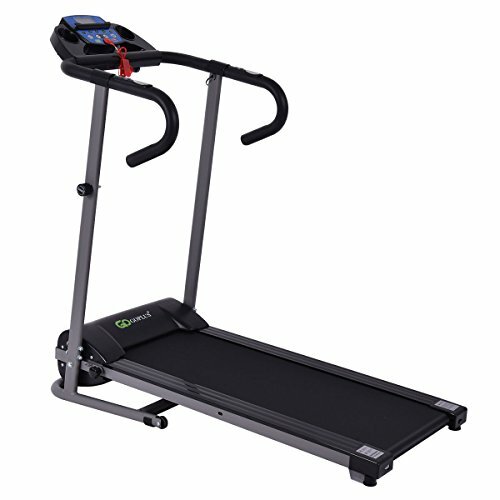 No Time For Gymnasium？With This High-Quality，Foldable And Easily Operated Treadmill，Your Home Is Your Gymnasium.This Goplus Folding Treadmill Is Ideal For Everyday Running Workout Fitness. It Features Easy-Fold Design For Easy Storage And Heavy-Duty Steel Frame. You Could Take Exercises At Your Home Without The Hassle Of Going To The Gym. Keep Running And Burn Calories To Keep Fit And Enjoy A Healthy Life. Welcome! 【Heavy-duty Construction】Frame is made of high quality steel, has 220Lbs weight capacity, 39"L x14"W ruuning belt provides you more comfortable and more sturdy workout experience. 【100% Warranty】We offer you 100% risk-free satisfaction guarantee to let you buy with confidence. We are quite sure that you will be super-impressed with DURABILITY, PORTABILITY and HIGH QUALITY of our treadmill.